Make Vim look like Sublime Text 2? I am working to make a switch from SB2 to vim. Currently I am going through vimtutor to do some exercises then it dawned on me that I needed color when it is time for me to code. For C++ and Python, how can I make it so that my "if"s, "while"s and "return"s are red. Return types are blue, etc? Is there a plugin that I can use in vimrc? Or do I have to do this manually. Mind you I don't just want to install any ol' theme because I really like the default sublime text 2 colors. Great color scheme, looks extremely similar to inkpot though. The default on that page IS Inkpot. There are also hundreds of others. is by turning syntax on and using a colorscheme. Then look around the web for a cool colorscheme, there are many hundreds. 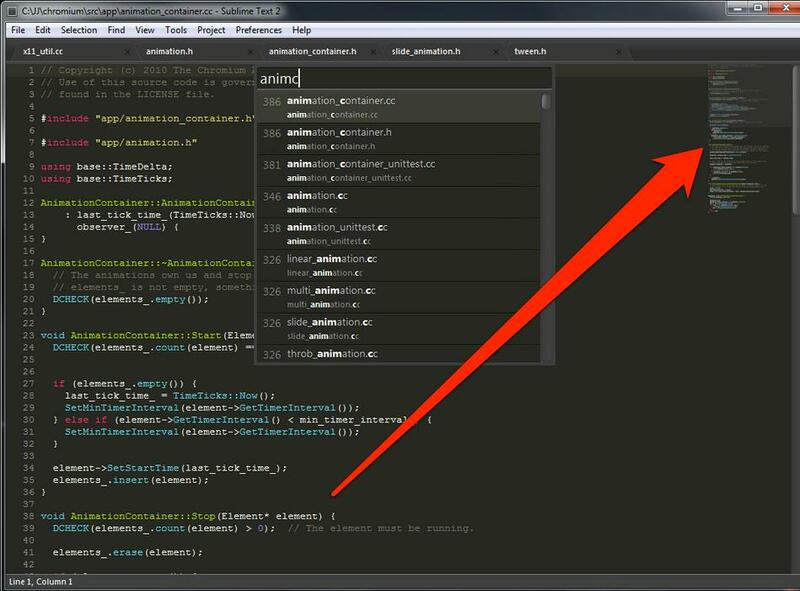 You're looking for Sublime Text 2's default color scheme, which is Monokai. 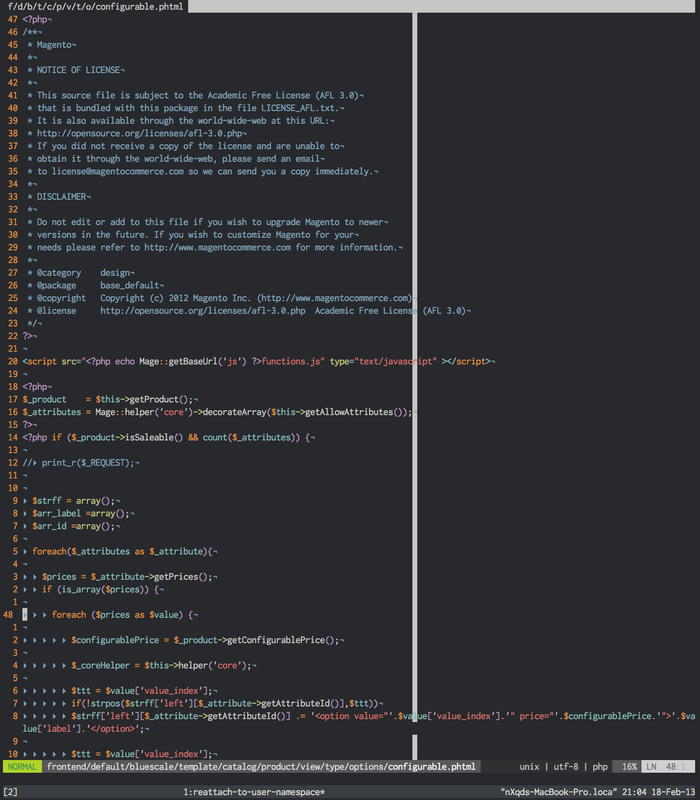 You can see this yourself by going into sublime text 2>Preferences>Color Scheme. You could also use molokai which is very similar. I would suggest installing Solarized. It is a fantastic color scheme. To each their own...I used to switch color schemes every month or two until I started using Solarized, which I've stuck with for a year now with no desire to change. And yes, I probably stare at it at least 6 hours a day, pretty much every day. For the record, I'm using the light background and also use redshift, which automagically adjusts the color temperature of my screen based on the time of day. Why do you like redshift? It eases eye strain, the bright white light that comes from monitors causes eye strain faster than a warmer, more natural light. redshifting light makes it "warmer" and thus, more comfortable. Why do you say that? I'm just curious. I said that because I hate solarized. I find that it is difficult to read text with it compared to colorschemes like jellybeans or xoria256. Of course, I realize that whether or not something is good is subjective, I just get annoyed any time I see someone recommending solarized. Yeah that makes sense. I had to tweak the Solarized settings to get it working well. By default the contrast is far too low. Really? I use Solarized at work, and really like it. Much better than the defaults, at any rate. I should probably lrn2read. I'll check those out. I tend to switch color schemes every so often. I have liked solarized because the dark and light backgrounds are inverses of each other. I have also found it to work really well with diffs. If you think it looks good in screen cap but not in use maybe it's a config error? Just curious as to the reason you don't like it. Also wondering how xoria256 looks in vim diff. How confrontational. I agree though, that I've tried the solarized schemes and find them very hard to use, and yes, Jellybeans works for me. Just because something's hipstertastic doesn't mean it's not good though, and I'd personally rank solarized well above most of the "classic" schemes. Try the colorscheme Molokai for vim. It's close to SB2 I think. I got giddy when I saw how many comments this question had, because I thought it was this awesome scroll-overview-thingy-feature that I'd love to see in vim, even though I imagine it'd be super difficult, if not impossible. That is pepper hot. Thanks! This is cool, but I'm curious about how it's useful. I'm not questioning that is. I just don't know what I'd do with it. How do you use it? Impossible. Also what is that feature even good for? I never understood why that would be beneficial. So you can see all your code? Okay, why do you need to see where you are in the file? For a visual person, it just provides a nice overview of where I am in a document. I work on a C++ protein CAD project that has classes with 1000-3000 lines of code split between dozens of functions. It's like asking "Why is there a minimap when you play FPSs or RPGs?". The answer seems rather obvious. No, it's not obvious at all. Of course it's a "nice overview" of where you are, but so what? What benefit is that? So you have 3000 lines in a class. How does a minimap help you navigate that? You can't read any of it in the minimap. Excuse me for not "getting" it.